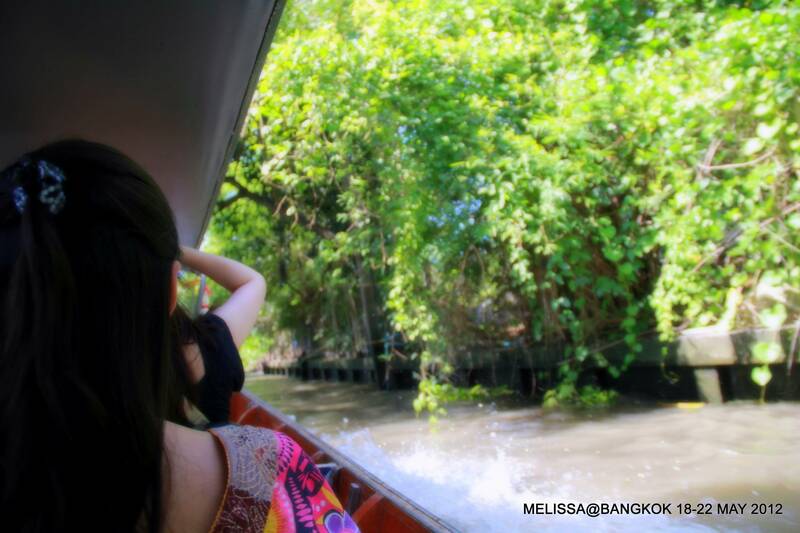 Continuing from my previous post of Maeklong Railway Market Bangkok, we head over to Damonen Saduak Floating Market. 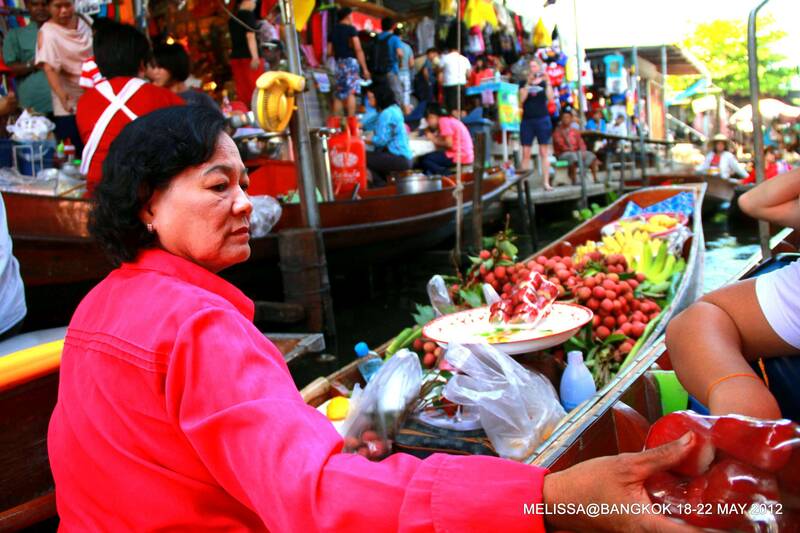 There are few floating markets in Bangkok. 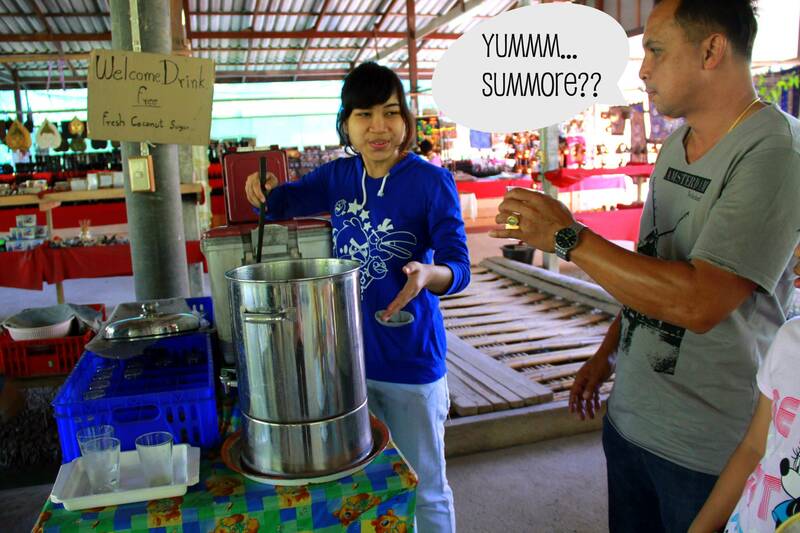 But I think Damonen Saduak Floating Market is the popular one. Moreover this place is often published in Travel magazine. From Railway Market, McD driver send us to the jetty which took about 10-15 minutes drive. 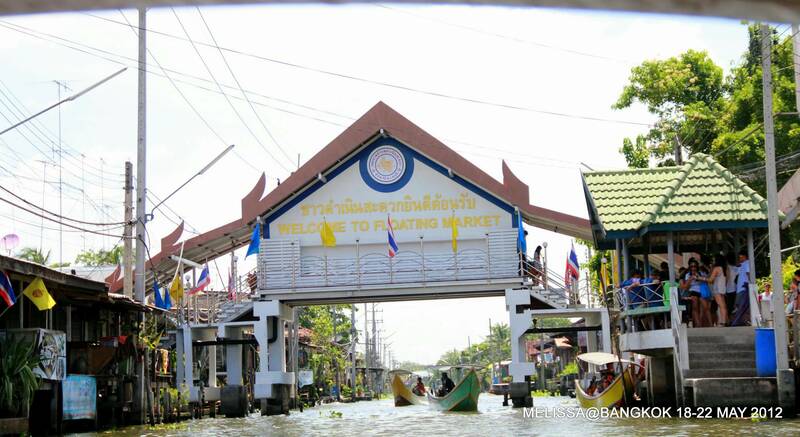 The Damnoen Saduak Floating Market is located at Damnoen Saduak District, Ratchaburi Province, about 105 kms (65 miles) from Bangkok. 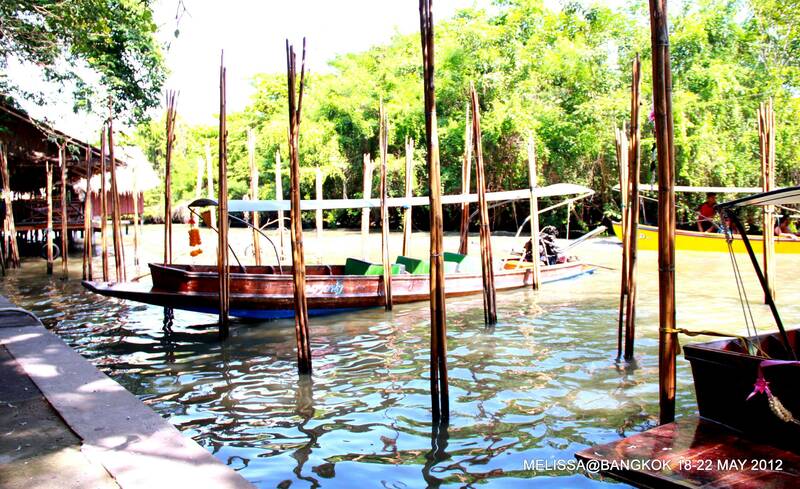 According to history around 1866 King Rama IV ordered that a 32 kms long canal be dug at Damnoen Saduak. This canal would connect the Mae Klong River with the Tachine River. 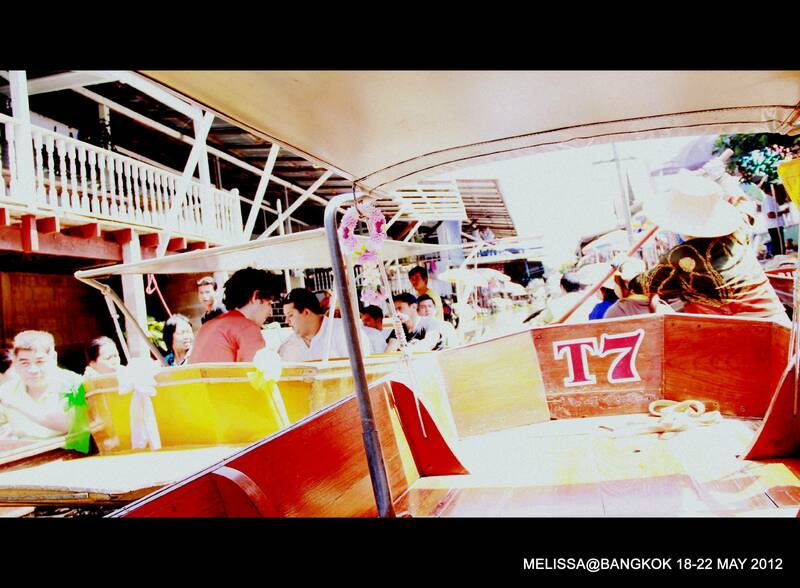 At the pier, we waited for our chartered long tail boat with engine to ferry us to the floating market. While waiting..we were served with Thai Coconut drink. (Wahh…good hospitality wor)-all inclusive in that 3000 baht we paid earlier. 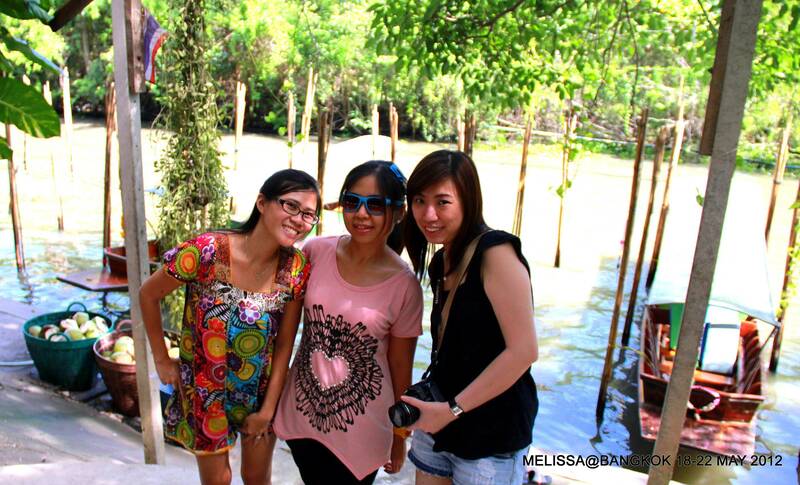 a group photo with my gfs. 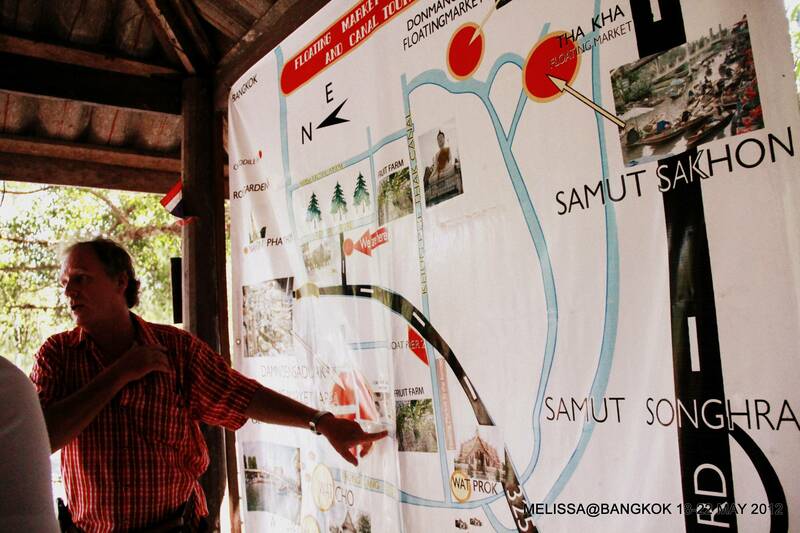 a simple briefing by angmo uncle on our location the places we’ll be visiting next. Passing by some narrow parts of river/canal with wooden houses side by side plus the discharge just make me feel disgusted with the smell (smelly) and dirty. I tried to avoid whenever there are splashes from the water. 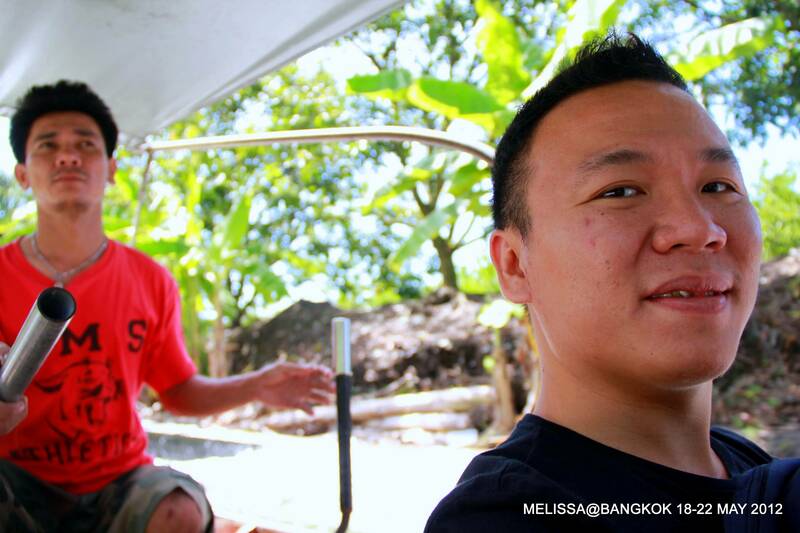 Luckily our ‘motor boat’ has ‘bumbung’. Else I’ll become roasted Mel later. Moreover the seats are with cushion! 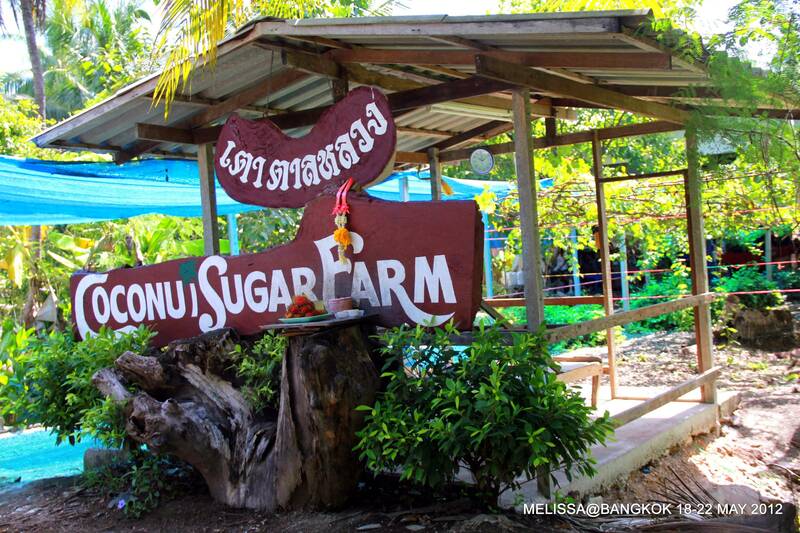 Pit Stop at Coconut Sugar Farm – to see how the locals make coconut sugar. 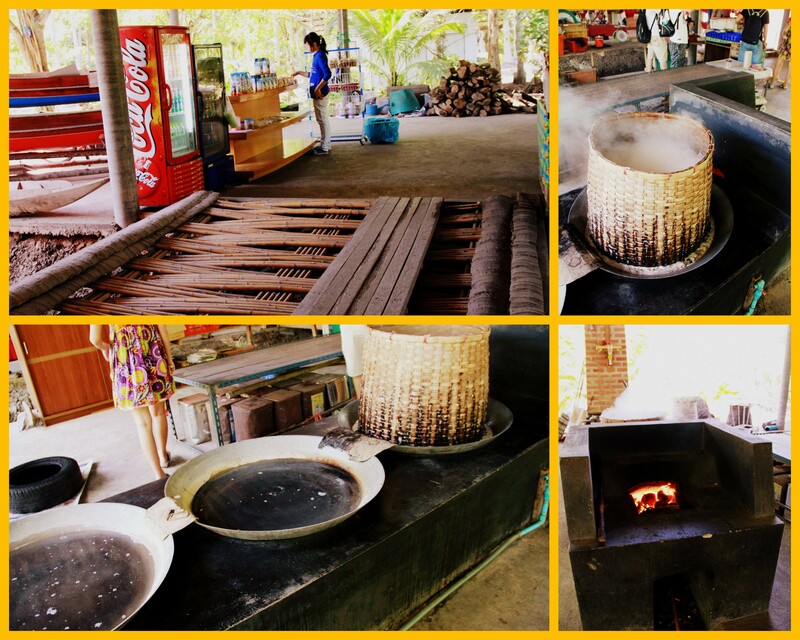 The place for making coconut sugar. Where it involves boiling and heating. Various goods are sold here, along the canal. Food, spices, fruits, cooked food, souvenirs and imitation bags. It requires some bargaining. But since this is a tourist place..I don’t really feel the price is cheap. The result of getting there during weekend. *Traffic Jam*! Wanyi bought a pack of ‘Jambu Air’ which is very sweet. 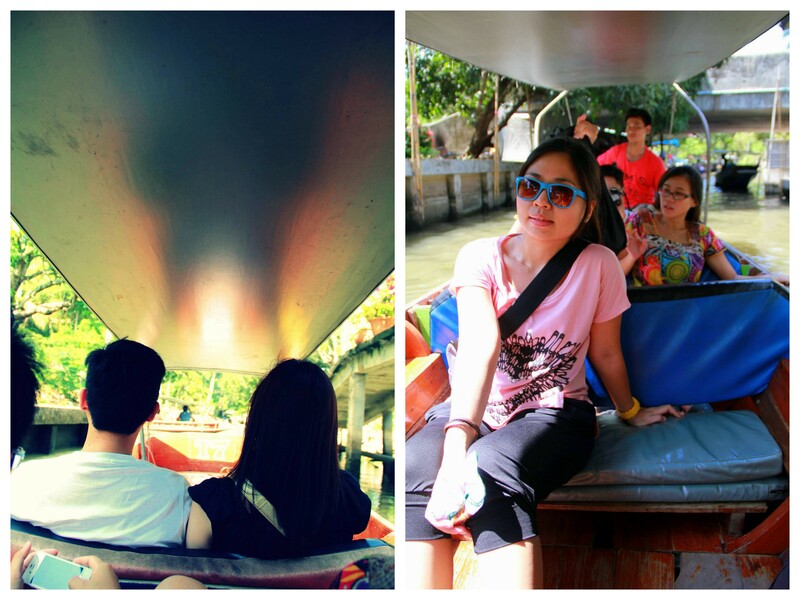 Our time spent on Damonen Saduak Floating Market was quite short. We did not purchase anything pun. 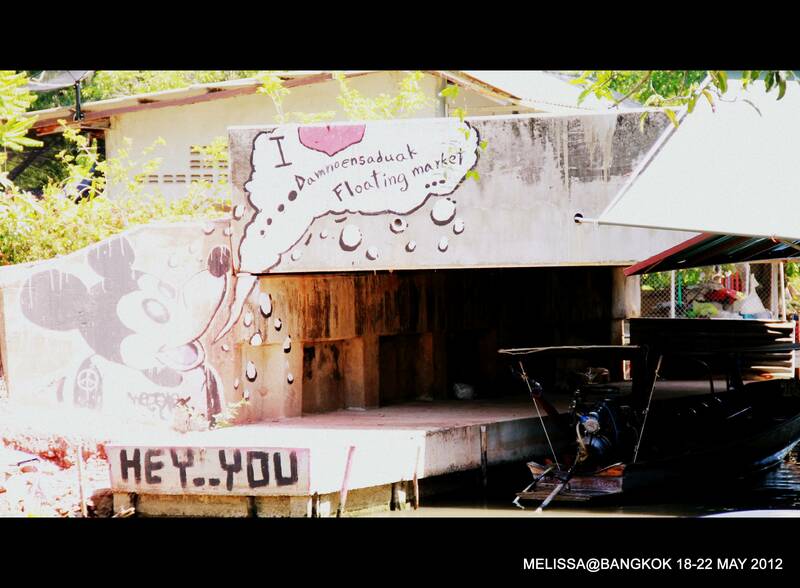 Hahahaha…..
Do I ♥ Damonen Saduak Floating Market?? I would say its a good experience to see the culture of a rural place. But don’t think I will re-visit. 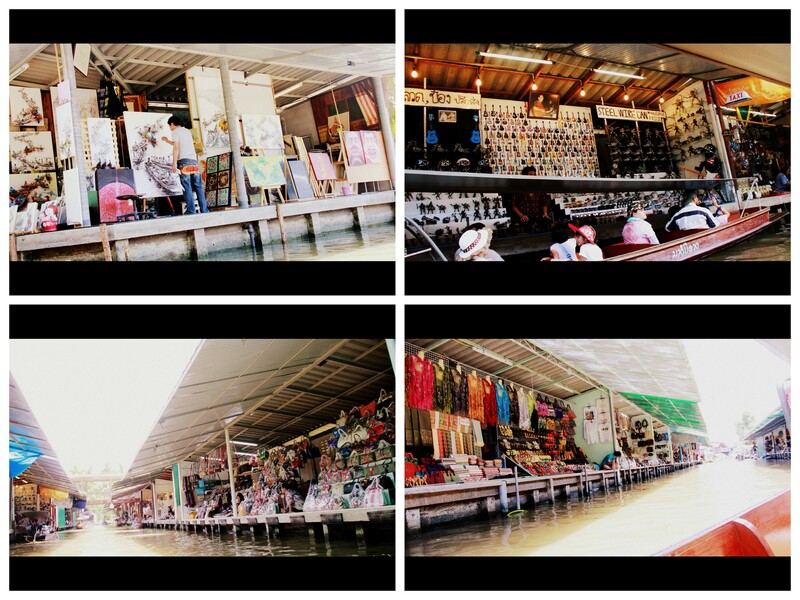 Or there are other better floating market? You suggest. Choi Yen – Ohh…the rowing ones. Did you enjoy the place? suituapui – Really ar? What was his reason for feeling disappointed too? Because its dirty? Not really dirty he said but nothing interesting – to him, at least. I think the railway market is more interesting than floating market then?Saw the documentary about that some time ago and always wanted to visit that railway market! Nice pictures btw! 3000baht is for the whole trip? or per pax?